This article is about Ostro, the ostrich creature in Super Mario Bros. 2. For the boss character mistakenly labeled as "Ostro" in the Super Mario Bros. 2 cast roll, see Birdo. Ostros are large, flightless birds that first appeared in Super Mario Bros. 2, and are said to be a mode of transportation in Subcon. They are the first species that allow Mario to ride, even though they are enemies. In the cast roll of Super Mario Bros. 2, Ostro's and Birdo's names were switched, causing some confusion; this mistake was fixed in Super Mario Advance. Ostros made their debut in Super Mario Bros. 2, where they were ridden by red Shyguys that try to steer them towards the player. If their rider was dislodged the Ostro will travel in a straight line. 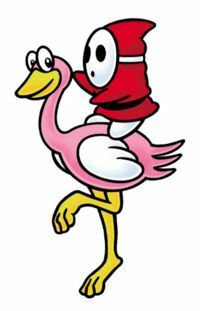 Players can jump on top of an Ostro and ride it across obstacles regardless of whether or not it already has a Shyguy rider. Ostros can be picked up with very little effort, but they don't bounce when thrown. In Super Mario Advance, they drop hearts when defeated. While Ostros are black with white wings and legs and red eyes in the NES version of the game, subsequent remakes have depicted them as being pink with a white belly, wings that are the same color as their body, orange legs, black eyes and a pink feather on their heads. The artwork for Super Mario Advance is a mix between the original version and the remake, as, while it is shown pink, it lacks the feather on the top of its head, and has white wings. Several Ostros from The Super Mario Bros. Super Show! 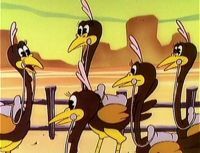 Several Ostros, though usually referred to as ostriches, appear in several episodes of The Super Mario Bros. Super Show!, where they are usually ridden and used to haul motorless vehicles, much like horses. Due to their role, Ostros never have any speaking lines, and usually make honking noises. They first appear in the episode "Butch Mario & the Luigi Kid", where several Ostros are used by Mario, Luigi, Snifits and several other characters as steeds to travel through the Wild West. A wild ostrich appears in "Too Hot to Handle" on the island of Waki-Waki. Mario, Luigi, and Toad ride it to reach Princess Toadstool faster. Ostros were also given homage in the Super Mario Bros. film, which featured a sign with the word "Ostro" on it; this sign is thought to be advertising a company or organization of some sort. Italian Strutzo (Super Mario Advance's booklet) From struzzo (ostrich). Coincidentally, the plural form of "Strutzo" is "Strutzi", the Italian name of Birdo. ↑ "He serves as a means of transportation in the world of dreams. Shyguys often ride him." - Super Mario Bros. 2 instruction booklet, page 26 (Ostro description). ↑ From the ending scenes of Super Mario Advance as localized by iQue. Source: 无敌阿尔宙斯 (August 28, 2013). 神游 超级马力欧2敌人官译 (Official names for iQue Super Mario 2 enemies). Baidu Tieba. Retrieved February 2, 2017. This page was last edited on March 22, 2019, at 22:30.